Located west of the perhaps better known "Bear Peak" part of Attitash ski area, Bear Mountain was once a popular skiing destination. While the peak now does not even have so much as a hiking trail, it once featured a CCC ski trail and was considered for a major alpine ski area development. 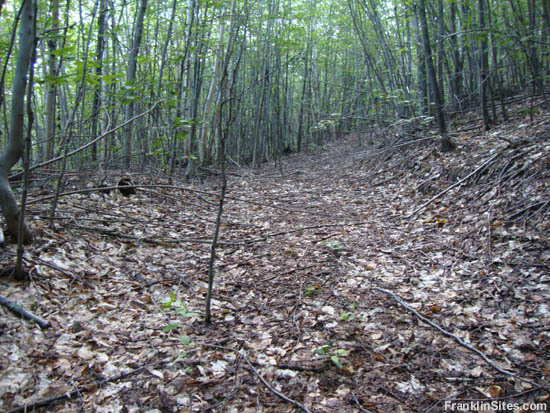 The Bear Mountain Upper Ski Trail was cut by the CCC in the summer of 1933. Over 2 miles long with nearly 2,000 feet of vertical drop, the upper trail ended at Bear Notch Road. 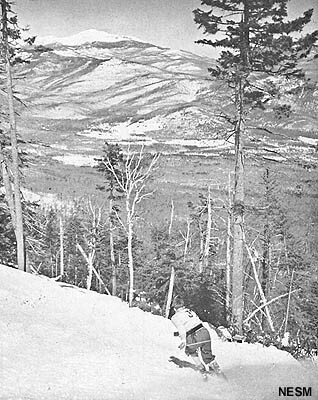 The ski trail was improved in the 1930s in hopes of relieving some stress from the very popular Wildcat Ski Trail. The trail was abandoned after a decade or two of use. The lower portion of the Bear Mountain Upper Trail followed a gradual logging road. Subsequent logging has made finding the remains of the trail a bit tricky today. The steep upper portion of the Bear Mountain Upper Trail appears to have vanished. 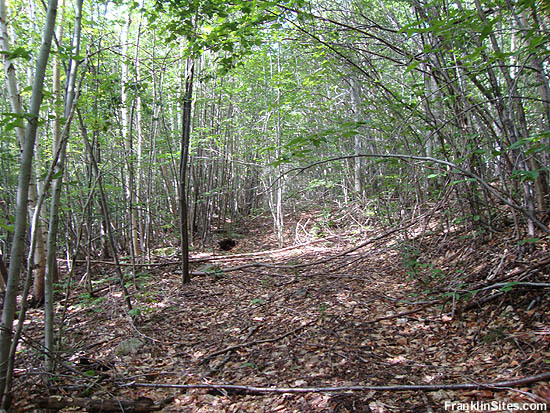 The trailbed of the lower portion of the Bear Mountain Upper Trail is still detectable. 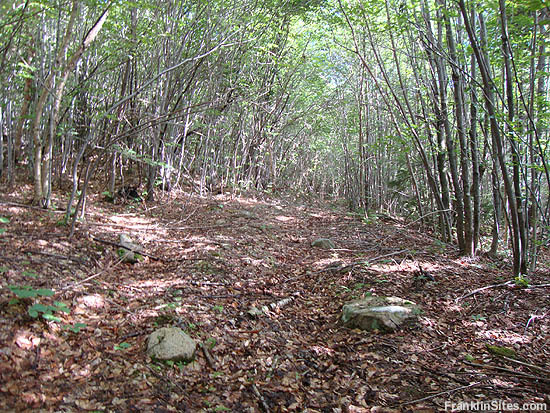 The Bear Mountain Lower Ski Trail was cut by the CCC in the summer of 1933. The trail started at Bear Notch Road and ran to the Bartlett Town Reservoir at a light pitch.
" In Bartlett as in many other New England villages in the 1930s, the first significant ski trails were cut by the Civilian Conservation Corps. 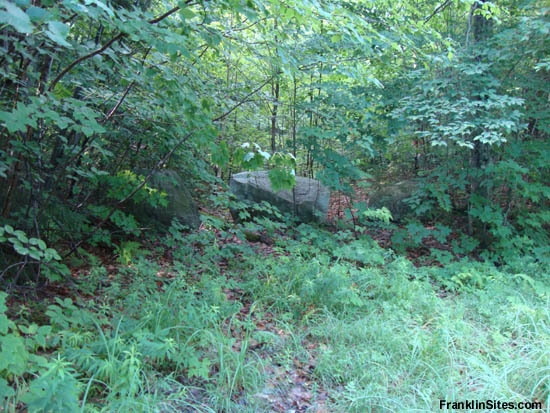 The CCC cut two trails in Bartlett in the summer of 1933--the Maple Villa trail on Bartlett Mountain in Intervale, and the Bear Mountain Trail south of Bartlett village. " " Bear Mountain Ski Trail. Bear Mt. (3,180 ft.), S.E. of Bear Mt. Notch, has no trail designed primarily for summer use. The ski trail, extending from Louisville Reservoir (see above, Bear Mt. 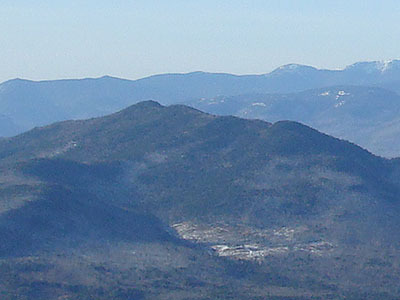 Notch Trail), to the summit, is easily seen in wintertime from highway E. of Bartlett. About 3 1/2 m. S. of Bartlett it crosses the Bartlett-Passaconaway Road, which thus divides the trail into parts. The upper or S. part is 1.4 m. long, has a drop of 1,700 ft., is 15 to 50 ft. wide and requires a minimum of 15 inches of snow. The lower part, between the Bartlett-Passaconaway Road and the reservoir, is 0.8 m. long, drops 600 ft., is 12 to 30 ft. wide and requires 8 inches of snow. The upper part is for expert skiers, except about 1/4 m. near the road. The portion of the trail below the road is suitable for novices. Both parts can be reached from Bartlett by the Bartlett-Passaconaway Road. To reach the lower end of the trail, the same road is followed from the main highway (N.H. 18) at Bartlett for 1/2 m., turning off here to the R. (W.) into the water works road, which is signed to the reservoir. N.H. 18 is kept open throughout the year and it is probable that the Bartlett-Passaconaway Road will be kept open as far as the ski trail. " " April 3, 1934: "After dinner we left for Bear Mt. Trail. We were able to drive up road that intersects trail was (sic) saved all the grubby going on the lower portion. Started up trail about 1:20 and arrived at top around 2:45. Spent some time on top taking pictures. Visibility poor--temperature above freezing. Snow wet at bottom and higher up it was breakable crust. The trail is an excellent one with wide turns and quite steep--well worth trying again. Got back at 4:00. " 1. Location - From Bartlett take Bear Mt. Road which divides upper and lower sections of trail. Trail leads to summit of Bear Mt. 2. Length - 1.4 mi. 4. Max. Grade - 28º. 5. Vertical Drop - 1700'. 6. Exposure - N. 18" snow. 1. Location - See above. 2. Length - 2.2 mi. 5. Vertical Drop - 700'. 6. Exposure - N. 6-8" snow. 7. This section is very easy. " " Bear Mt. Upper Trail (W.M.N.F.). From Bartlett take Bear Mt. Road which divides upper and lower sections of trail. Trail leads to summit of Bear Mt. Length 1.4 m. Max grade 28º. Difficult trail. Bear Mt. Lower Trail (W.M.N.F.). Same as Upper Trail. Length 0.8 m. Max grade 15º. This section is very easy. " " Bear Mountain Ski Trail. Bear Mt. (3,230 ft.), SE of Bear Mt. Notch, has no trail designed primarily for summer use but may be ascended by the ski trail, which crosses the Bear Notch (Bartlett-Passaconaway) Road between the bridges over Albany and Louisville Brooks. There is ample parking-space nearby. A short distance above the highway the ski trail forks R from the old logging-road location. There is no water above the second crossing of Albany Brook, about 1/4 m. above the road. The trail is rough and steep toward its upper end. From Bear Notch Road 2 hrs. The ski trail, extending from Louisville Reservoir to the summit, is easily seen in wintertime from the highway E of Bartlett. About 3 1/2 m. S of Bartlett it crosses the Bartlett-Passaconaway Road, which thus divides the trail into two parts. The upper or S part is 1.4 m. long, has a drop of 1,700 ft., is 15 to 50 ft. wide and requires a minimum of 15 in. of snow. The lower part, between the Bartlett-Passaconaway Road and the reservoir, is 0.8 m. long, drops 600 ft., is 12 to 30 ft. wide and requires 8 in. of snow. The upper part is for expert skiers, except about 1/4 m. near the road. The portion of the trail below the road is suitable for novices. 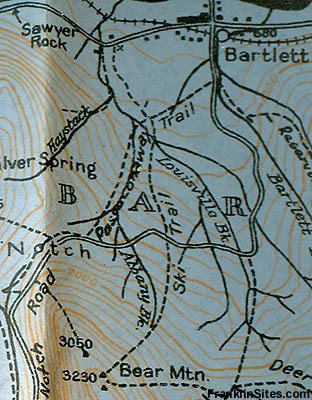 Both parts can be reached from Bartlett by the Bear Notch Road. To reach the lower end of the trail, the same road is followed from the main highway (US 302) at Bartlett for 1/2 m., turning off here to the R (W) into the water-works road, which is signed to the reservoir. US 302 is kept open throughout the year and the Bear Notch (Bartlett-Passaconaway Road is usually plowed. " " Bear Mountain Upper Trail in the WMNF at Bartlett has been widened, smoothed, and lengthened by CCC boys, and hazardous corners eliminated to increase safety and speed. The trail will be in use during the season for the U.S. Eastern Amateur Ski Association time trials, and greatly increased use by advanced skiers is expected. " 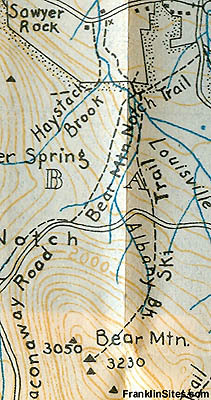 " March 23, 1941: A new spring smiled with approval in welcoming the Schussverein, on their annual return to Bear Mt., this time for their fifth invitation downhill on the mile long class A trail�.There was not a patch of ice or an exposed area to trick the rugged Garrett, winner of many eastern downhills, as he dropped 1700 feet through almost twenty angular turns that make the Bear Mt. Run one of our most testing of accurate turning and racing judgement and so distinguish it from many race routes characterized by schusses. " " Bear Mountain Ski Trail. This trail begins on the Bear Notch (Bartlett-Passaconaway) Road between the bridges over Albany and Louisville Brooks. There is ample parking-space nearby. A short distance above the highway the ski trail forks R from the old logging-road location. The trail is steep toward its upper end. From Bear Notch Road 2 hrs. " 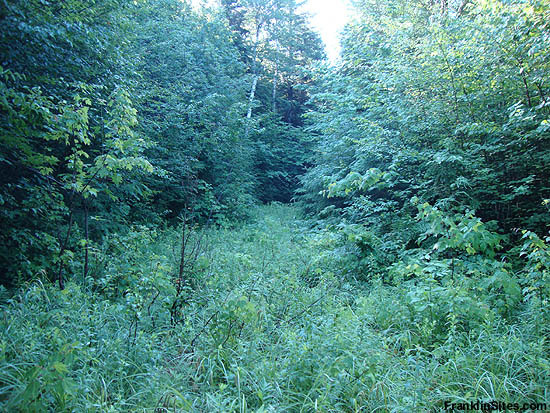 " Bartlett seems to abound in high points named for bears, and the mountain of the CCC trail was not the Bear Peak that is a relatively recent addition to Attitash. 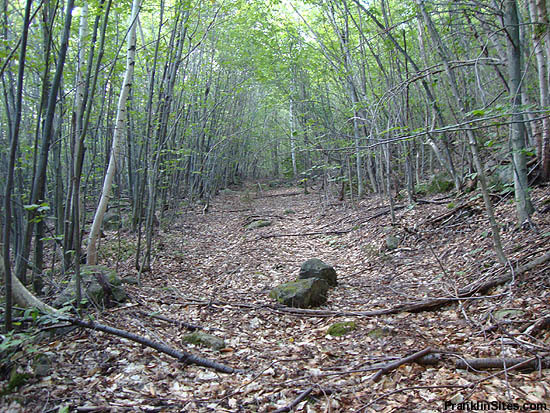 The CCC's Bear Mountain Trail was divided into an upper and lower section by the crossing of the then-new Bear Notch Road. The upper section was for experts, with a vertical drop of 1700 feet in less than 1 1/2 miles. It became a quiet favorite among the White Mountain ski trails, and became the particular domain of the Schussverein Ski Club, which ran an invitational race there from 1937 until the war years. 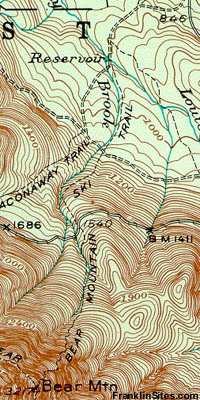 Shortly after the 1939 arrival of Austrian skimeister Hannes Schneider in North Conway, he and his instructor Franz Koessler surveyed the Bear Mountain Trail and recommended that it be rated a Class A race trail. This designation was granted by the Eastern Amateur Ski Association, and meant that the Bear Mountain joined four other New England trails--the Wildcat, Nose Dive, Taft and Thunderbolt--as venues for racing's most severe tests. The legendary 1939 American Inferno on Mt. Washington had its genesis at the 3rd Schussverein invitational downhill on the Bear Mountain Trail. "Last week as we stood on Bear Mountain and viewed the complete snow covered beauty of Mt. Washington, there was a hue and cry from the old guard that we must revive the old Hochgebirge Inferno Race, which means the old down Mt. 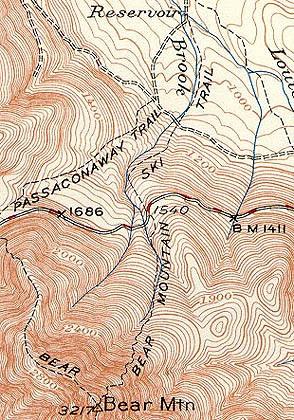 Washington Race from Summit to Pinkham Notch," wrote Alec Bright to the White Mountain National Forest Supervisor. In a matter of weeks Bright and his Ski Club Hochgebirge had organized the race that is remembered today for Toni Matt's hair raising schuss of the Tuckerman Ravine headwall. " Corey, Robert B. "Taming The Bear." Ski Bulletin. March 28, 1941. http://www.skimuseum.org/page.php?cid=doc144. Leich, Jeff. "Sketches of Bartlett NH Ski History." New England Ski Museum Online Journal. January 21, 2006. http://www.skimuseum.org/page.php?cid=doc28. Lord, Charles. "Skiing Notes." 1980. http://www.skimuseum.org/page.php?cid=doc144. Tuttle, Don. "New Hampshire Lures Skiers With Many New Developments." Playtime Guide to America's Playlands. December 1940. http://www.skimuseum.org/page.php?cid=doc144.